Breakfast items like pancakes, Dutch babies, ebisklivers, crepes, and beignets, are the perfect excuses for eating cake for breakfast. I have recently been introduced to palachinki by my friend, Inna. 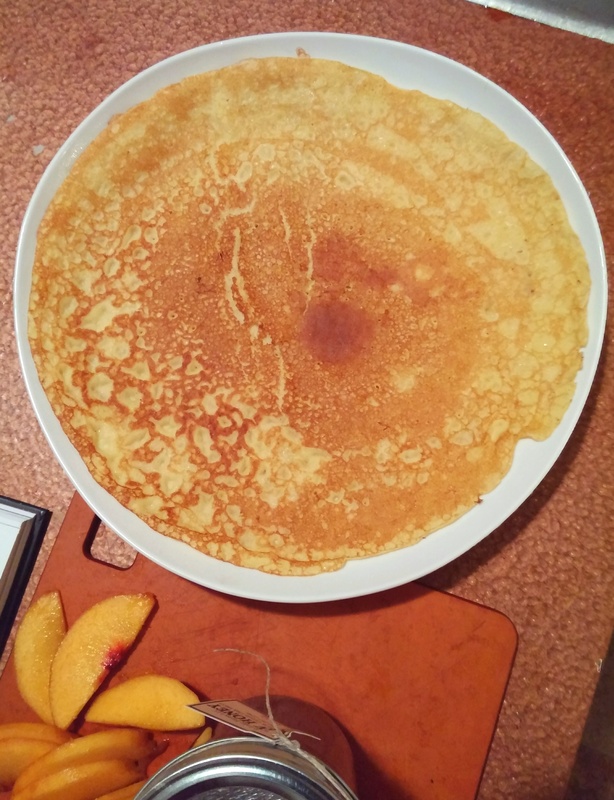 Palachinki are common in Bulgaria and seem like a cross between pancake and crepes. 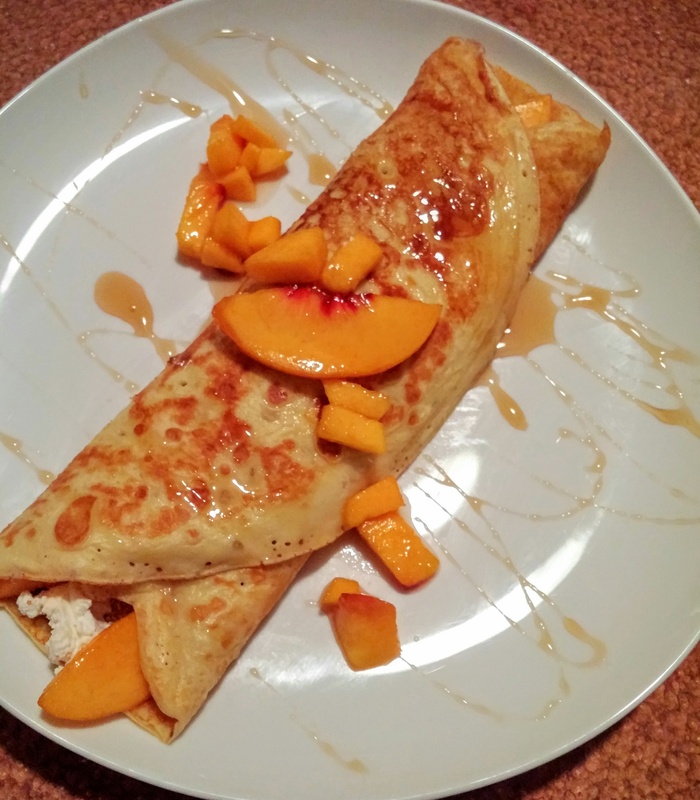 They are thinner and larger than pancakes but not as thin as crepes so they can be rolled up and eaten with your hands. Palachinki can be dressed up any way you like, sweet or savory. 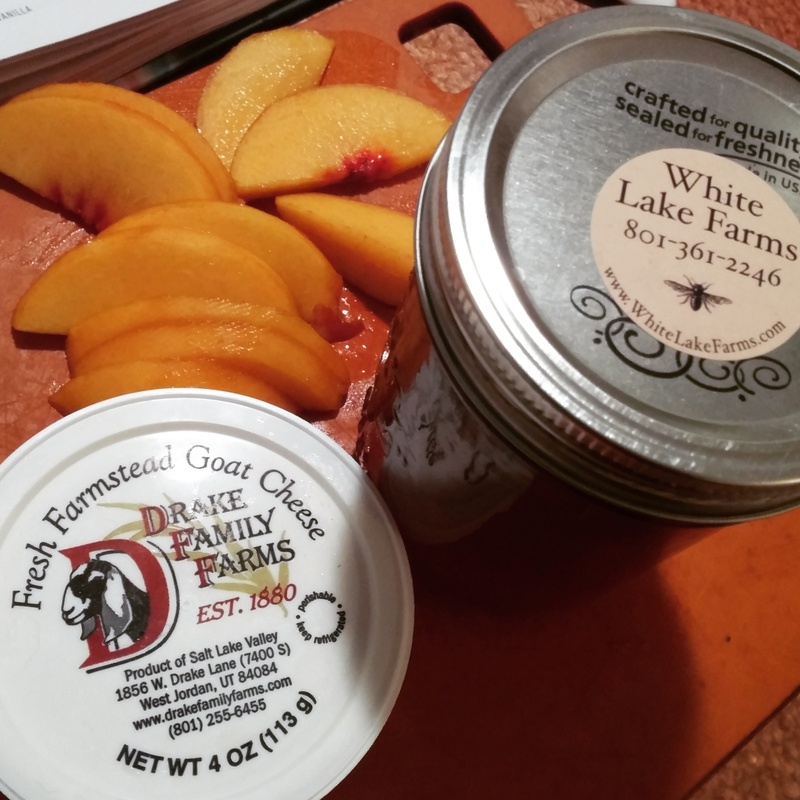 Today I’ve chosen a Bulgaria meets Utah combination of palachinki with Brigham City peaches, local Utah honey, and Drake’s Family Farm’s goat cheese. Some suggestions I’ve seen via the web say to use just milk and not water. One recipe I read said to use sparkling water. Many recipes said to mix the batter in the blender, which I did for this recipe. The batter for this recipe was thinner than most batters I’ve seen. I wanted to add more flour, but since it was my first time making it I just trusted the recipe and they came out just fine. Mix everything together in a large bowl. You can pour the batter through a sieve or put it in the blender to remove any lumps. Heat a skillet to medium and use butter or olive oil before each application of batter so that they won’t stick. I used a flat round grill pan, but a skillet works as well. Pour the batter in the pan until the circumference is about the size of a dinner plate. 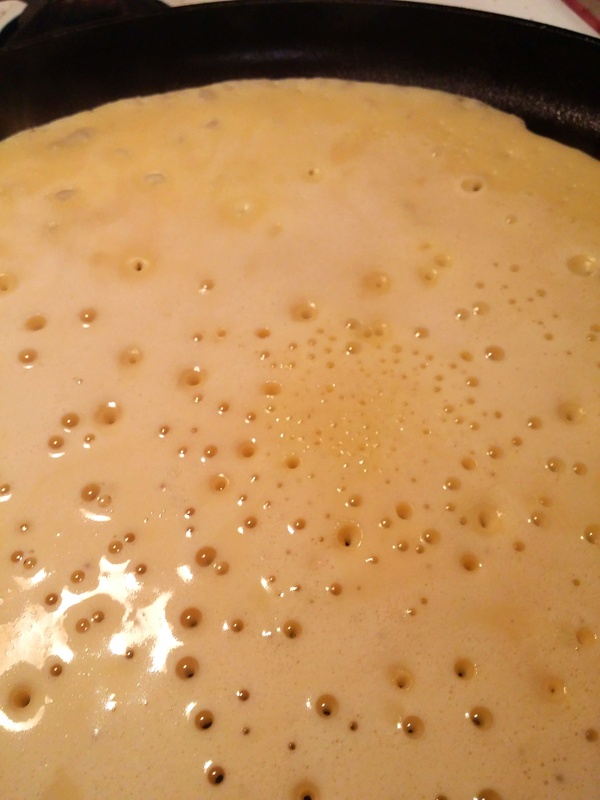 Little air bubbles will appear throughout, just wait until the edges look semi cooked and the batter is nearly set, then flip it using a spatula. Each side cooks for less than 2 minutes. You want a golden toasted color. Serve warm. 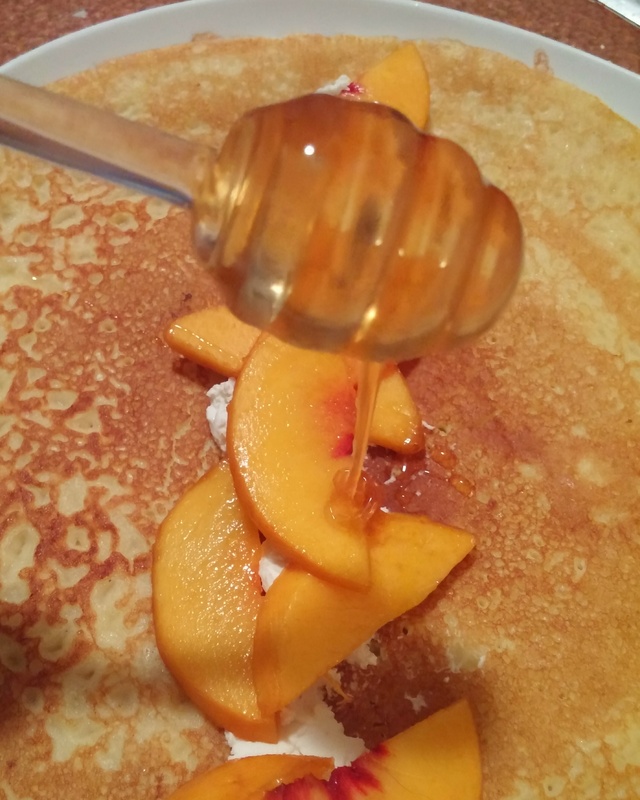 Fill with any sweet or savory fixings or just have them with a little honey. I was able to flip the palachinki without tearing them. They are actually very forgiving, so if they fold when you flip them they are easy to straighten out. I made extra and used them later by just reheating them on the grill pan or I suppose you can use the microwave as well. I referred to multiple palachinki as palachinkies. My friends laughed. Apparently palachinki is already plural. I want to try replacing the water in the recipe with a hard apple cider and see what that does. I’ll use a mixer instead of the blender. I’d also like to try some savory fillings and you can never go wrong with Nutella. If you have a palachinki recipe, please share below. Leave comments with any ideas for tasty fillings. Next Post Ch…ch…ch…changes, new baby and a new blog name.